ALL-NOVEL WESTERN seems to be going for a bit of a RANCH ROMANCES look with this cover, which isn't a bad thing, of course. It's hard to say much about the contents since three of the five authors -- Ronald Flagg, Clint Douglas, and Paul Adams -- are house names, and the other two -- William A. Langford and Chess Pitt -- I've never heard of. One thing to note: they have the Flagg name reversed on the cover, so somebody made a mistake pasting it up, I guess, and nobody caught it. I do like some of the titles: "Stepson of the Outlaw Clan", ".45 Frameup", and "The Trigger Trail-Blazer". I’d never heard of this graphic novel from 2011, but I came across a copy and saw that it has blurbs from Charles Ardai and Sean Phillips, so I figured it would be worth a try. The plot has a classic noir set-up: low-rent private eye is hired by a rich guy to keep tabs on his beautiful trophy wife. Instead of doing his job, the private eye begins having an affair with the trophy wife. And then, of course, the rich guy winds up dead, the cops think the wife killed him, and the private eye has to find the real killer to clear her name. 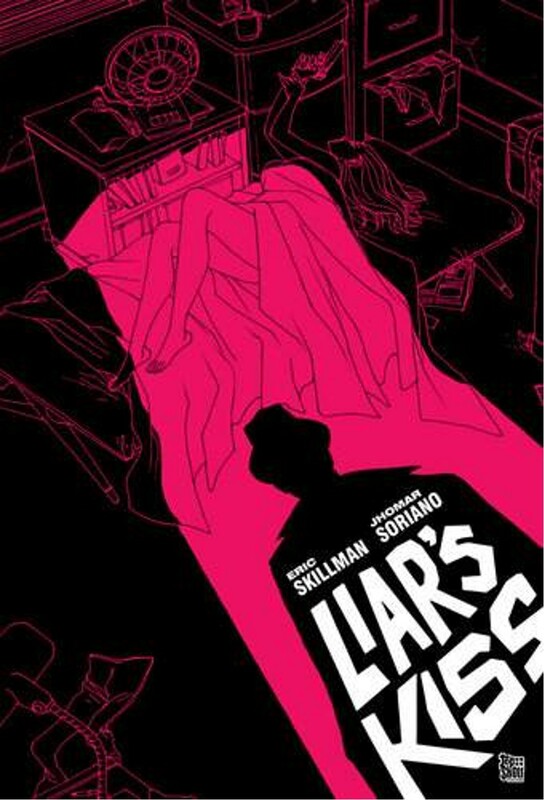 LIAR’S KISS makes heavy use of some elements we’ve come to expect from such stories. The protagonist, private detective Nick Archer, comes across as pretty much a stereotype. Not only does he have a name that could have come out of a Fifties Gold Medal or Dell First Edition novel, he wears a trenchcoat and a hat (it’s not a fedora, no matter what the people in the book call it), he smokes and drinks too much, he has a loyal secretary, he gets hit on the head and knocked out. The cops hate him, and the trophy wife is the sort of femme fatale you can never really trust. The plot gets pretty complex, with the origins of the current case stretching back years to two more deaths. We’ve certainly seen all this before. But scripter Eric Skillman has a really nice twist saved up, the sort that makes you look back at what’s come before to see how the groundwork was laid. The dialogue is great, the story is well paced, and it also does a fine job of playing with the reader’s expectations. The art by Jhomar Soriano is good, too, and I especially liked the way he varied his style between the main story and the flashbacks. LIAR’S KISS is very enjoyable and well worth reading, especially if you’re a fan of noirish private eye tales. Recommended. If you’re looking for an action-packed alien invasion yarn with likable protagonists and plenty of despicable villains, both alien and human, you won’t go wrong with LEVEL 7: DANGER CLOSE, a novelette by award-winning action/adventure author Nathan E. Meyer. This serves as a companion piece to Meyer’s forthcoming Level 7 novel THE JUDAS PROTOCOL. Both are based on a science fiction/horror game published by Privateer Press, the company that does the Iron Kingdoms game. The Level 7 universe centers around a sinister pact between the U.S. government and a race of aliens known as the Ghin who have been on Earth secretly for decades. In DANGER CLOSE, another race of aliens hostile to the Ghin arrives and attacks a New Mexico town close to an abandoned Ghin base. 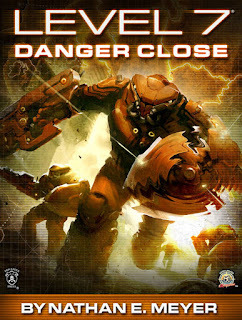 Most of the story involves the grunts sent to battle these new aliens, as good military SF should. And this is very good military SF indeed. Great action scenes abound, but Meyer doesn’t neglect the characters, either, although at this length there’s a limit to how much he can explore them. It’s all very entertaining and inventive, and I’m looking forward to reading the full-length novel based in this setting. Recommended. As often happens, this one is overlooked only in the sense that I didn’t see it until now. THE BEST EXOTIC MARIGOLD HOTEL isn’t the sort of film I usually watch: a light drama about a group of British retirees living in a rundown hotel in India. Nothing blows up real good. But I enjoyed it quite a bit anyway. It’s well-written, funny, and touching. 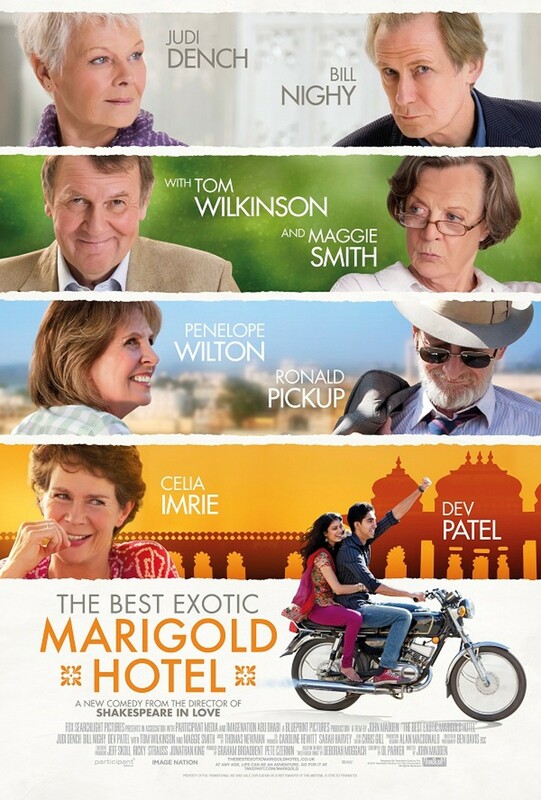 The cast, full of stalwart British characters like Judi Dench, Bill Nighy, Tom Wilkinson, Penelope Wilton, and the great Maggie Smith, is excellent. This is just a nice, sweet movie that’s a two-hour cure for all the crap in the world. I think you have to have achieved geezer status, or at least be fast approaching it, to fully appreciate it, though. 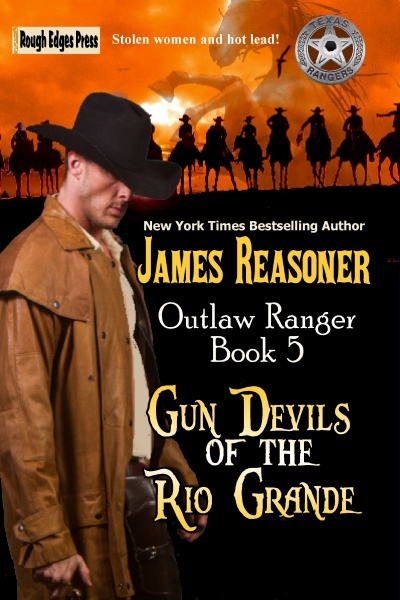 My latest Outlaw Ranger novel, GUN DEVILS OF THE RIO GRANDE, is now available in both e-book and print editions. 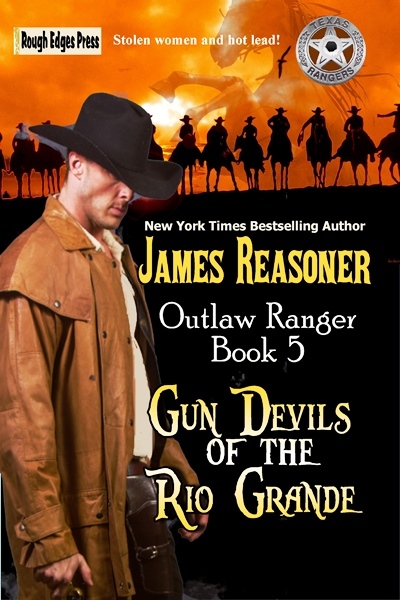 I had a great time writing it, and with any luck there'll be more Outlaw Ranger books in the future. The print edition includes as a bonus the Outlaw Ranger novella THE LAST WAR CHIEF, which wasn't long enough for a print edition of its own. That's a pretty good deal, if I do say so myself. I've also done a little work on a new series of Western novellas, but when those will be available, I have no idea. The Texas Rangers had their hands full cleaning up the border country. Bandits raided across the Rio Grande with impunity, rustling cattle, killing settlers, and terrorizing the countryside. But a handful of men armed with Colts, .50 caliber Sharps rifles, and pure guts would ride in and restore law and order to the border—or die trying! Based on actual events, acclaimed Western author David Hardy’s novella RANGER LAW, BANDIT BLOOD is another gritty, exciting tale of the violent frontier. Ride with the Rangers and smell the gunsmoke as they take on overwhelming odds and battle not only bandits but also the Mexican army. David Hardy writes it like it was, recapturing the wild times along the border with all its danger and fury! I don't know if the scene depicted in this Allen Anderson cover is actually in Dan Cushman's "Waif of the Wilderness Pack" or any of the other stories in this issue of NORTH-WEST ROMANCES, but if it is, I want to read it. Unfortunately, I don't own a copy of this issue, so I'll have to be content with enjoying the cover. The other authors in this issue include a couple of guys named Jack London and Robert Service, who knew a thing or two about writing Northerns. I founded the WesternPulps Yahoo Group 17 years ago today. I always forget to say anything about it on the group, so I scheduled this blog post to make sure I didn't forget this year. When I founded the group it wasn't on Yahoo. It was on something called E-Groups, I think. Then it became One List. Or maybe it was the other way around, I'm not sure. But eventually Yahoo swallowed up whatever service it was on, and there we still are. Of course, email groups are dinosaurs in this day and age, even older than blogs. But I have a great fondness for WesternPulps. It limped along with hardly any posts for the first year or so, then a fellow named Kent Johnson (who has since passed away) joined and started promoting it and posting all the time, and he really jump-started the group. For a while it was pretty high-traffic, reaching a high of 703 messages in February 2002. These days 50 messages is a good month. Still, I think it's a very worthwhile group, if for no other reason than the wealth of information to be found in the files and archives. I also love it because of all the friends I've made through the group, many of whom are regular readers of this blog and are also my friends on Facebook now. But WesternPulps was there first, and it's going to stay around as long as I can possibly manage it, maybe until I'm just posting messages to myself again, the way it started. But in the meantime, if you want to come say howdy to an old social media dinosaur, the group can be found here. 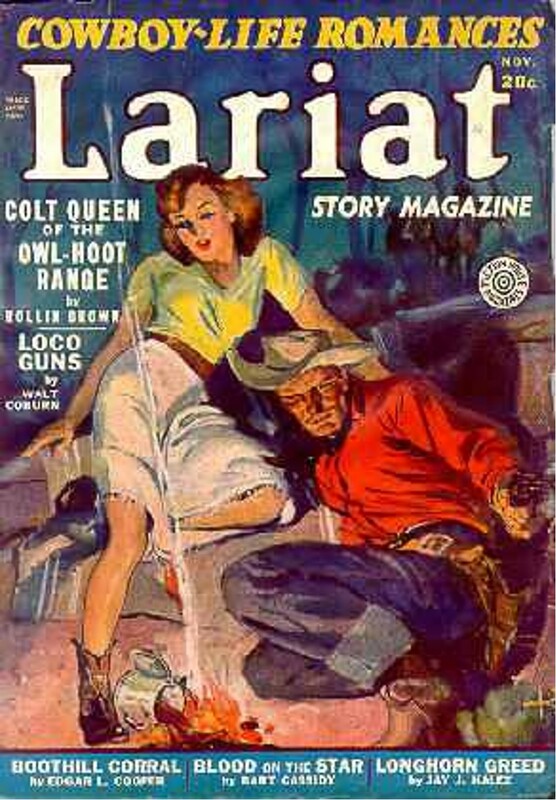 I'll bet that cover caught a few eyes on the newsstands back in 1942, and with authors inside like Walt Coburn, Rollin Brown, Jay J. Kalez, and Bart Cassidy (quite possibly Harry Olmsted, but hard to say for sure because Bart Cassidy was a house name), I'll also bet this issue of LARIAT STORY MAGAZINE was well worth reading. 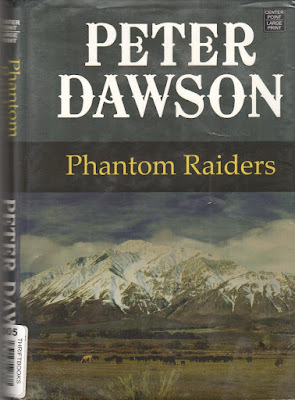 I wrote about Luke Short (Frederick D. Glidden) last week, and this week we’ve got a collection of pulp novelettes by his brother Jonathan Glidden, who wrote under the name Peter Dawson. 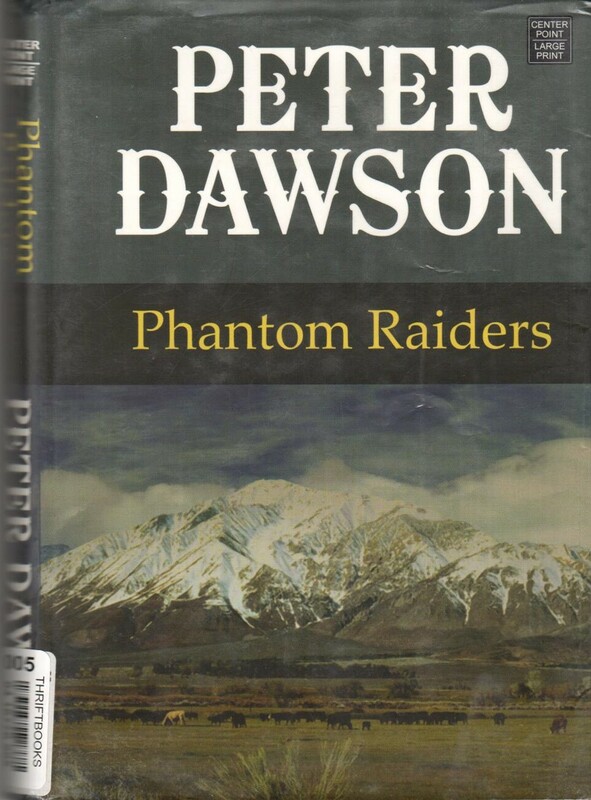 Although Jon Glidden never achieved quite the same level of fame and popularity as Fred did, he was a successful and well-regarded Western author for many years, his novels selling well enough in paperback that after his death, Bantam hired another author to write several more books that were published under the Peter Dawson name. I’ve enjoyed his work for many years, starting with the novel TRAIL BOSS, which I read all the way back in seventh grade almost five decades ago. 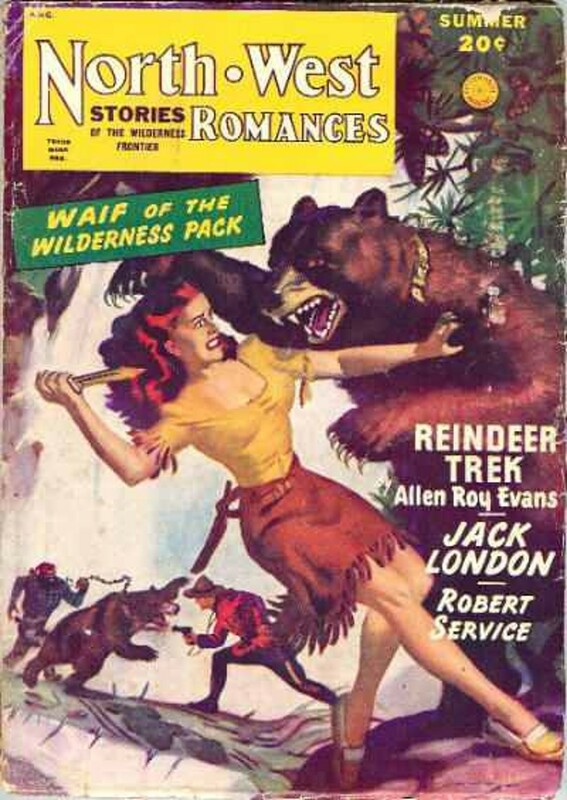 PHANTOM RAIDERS, published in large print by Center Point back in 2008, reprints five excellent novelettes from a variety of sources, starting off with “Retribution River” from the September 1948 issue of WESTERN STORY. 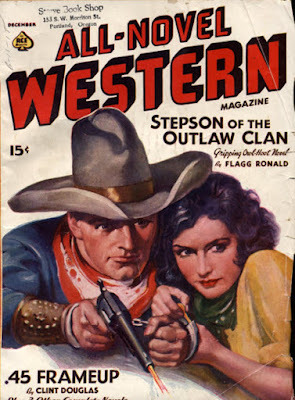 As Jon Tuska mentions in his story notes, this was Jonathan Glidden’s last publication in WESTERN STORY, which had serialized his first novel THE CRIMSON HORSESHOE some eight years earlier and published many of his shorter works. This one is a fine, fast-moving story about a rancher framed for rustling who goes on the owlhoot and discovers that’s an even more dangerous line of work. “Cutbank Welcome”, first published under the somewhat misleading title “Cutbank Welcome for Wet-Cattle Thieves” in the November 1940 issue of BEST WESTERN, also concerns a rancher who’s been framed, but for the more serious crime of murder. This one has a particularly effective opening as the rancher is about to be lynched. “Signed on Satan’s Payroll”, which originally appeared in the March 1938 issue of STAR WESTERN, also centers around rustling, but it has an interesting twist on the usual big ranchers vs. small ranchers plot, and it throws in a well-depicted blizzard for good measure. 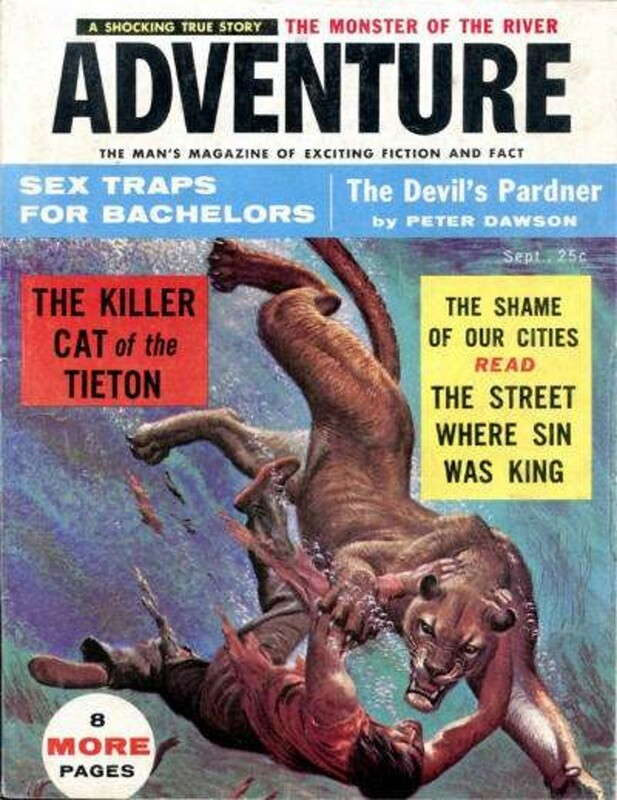 “The Matched Pair”, which was the last piece of short fiction Jon Glidden wrote, was published under the title “The Devil’s Pardner” in the September 1956 issue of ADVENTURE, well after that magazine had ceased to be a pulp and had become a men’s adventure magazine, although obviously it was still running some fiction. This story is a change of pace for Glidden, as it’s more of a domestic drama that reminded me of some of Ernest Haycox’s stories. It’s very well written and has a poignant ending. 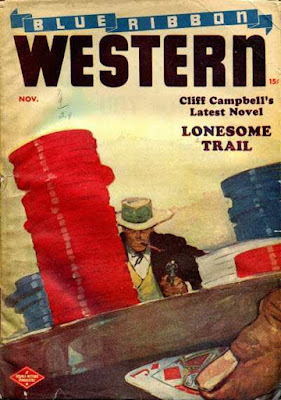 “Phantom Raiders” is another story that first appeared under a long-winded and misleading title, “When Blood and Guns Brand a Man’s Backtrail”, in the February 1941 issue of WESTERN NOVEL AND SHORT STORIES. It’s about a lone outlaw continually frustrating the efforts of a gang of desperadoes and has a really nice hardboiled tone about it. One word of warning: the dust jacket copy gives away the big twist in the story, although it’s not anything an experienced reader of Westerns won’t have figured out anyway. All in all, this is a really fine collection and well worth reading. The cover scan is from the edition I own and read, but it’s pretty bland. 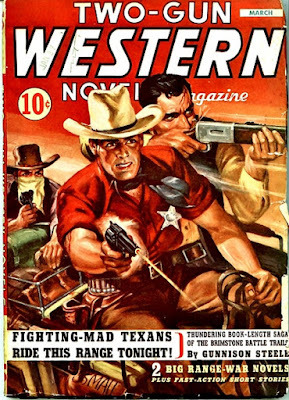 I would have included some of the original pulp covers, too, since you can never go wrong with a Western pulp, but none of them seem to be on-line. The September 1956 issue of ADVENTURE is, however, so here’s that cover, with the Peter Dawson story featured prominently. Husband-and-wife gunfighters J.D. and Kate Blaze never cared that much about politics, but after a shootout in Denver they find themselves riding the campaign train with President Ulysses S. Grant, protecting the nation’s leader and legendary general as he seeks re-election with a swing through the West. But danger is lurking in the mountains of Utah, and it’ll take a pair of fast guns to save the President from a deadly conspiracy! Award-winning Western author Michael Newton spins another action-packed yarn in BLAZE! : BADLANDS, the latest installment in today’s bestselling, all new Adult Western series! A great film, one of my favorites, and some fine theme music. A band of killers swoops down on a Mexican village, slaughtering the men and carrying off the women as prisoners. In Texas, a train is held up, American soldiers are murdered, and a valuable shipment of rifles is stolen. G.W. Braddock knows there’s a connection between these two bloody incidents, but to discover the truth and keep the border country from erupting in chaos and violence, he’ll have to risk his life more than once in a maze of double-crosses and danger! 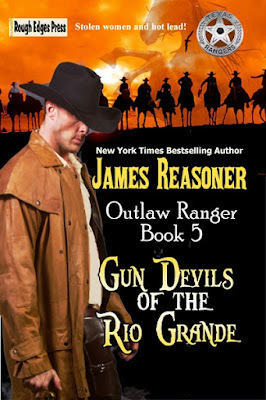 New York Times best-selling author James Reasoner returns with another action-packed, fast-paced tale of the Outlaw Ranger. Stripped of his authority by corrupt politicians, G.W. Braddock still carries the badge of a Texas Ranger—with a bullet hole in the center to show that he’ll go wherever he has to and do whatever it takes to bring justice to the Lone Star State! 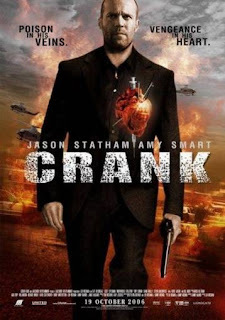 Did you see the first CRANK movie? Did you like it? Well, CRANK 2: HIGH VOLTAGE picks up right where that one left off and is more of the same, only goofier and more over-the-top. Jason Statham, who’s always watchable, plays the same character, who didn’t die at the end of the first movie after all. His heart is removed by Chinese gangsters and replaced by an artificial one that needs a jolt of electricity every so often to keep functioning, so he has to keep shocking himself to stay alive while he tries to hunt down the guys who stole his heart. The plot is even sillier than that brief description makes it sound, and the highly stylized direction by Mark Neveldine and Brian Taylor, who also wrote the film, squeezes every possible bizarre image out of it. 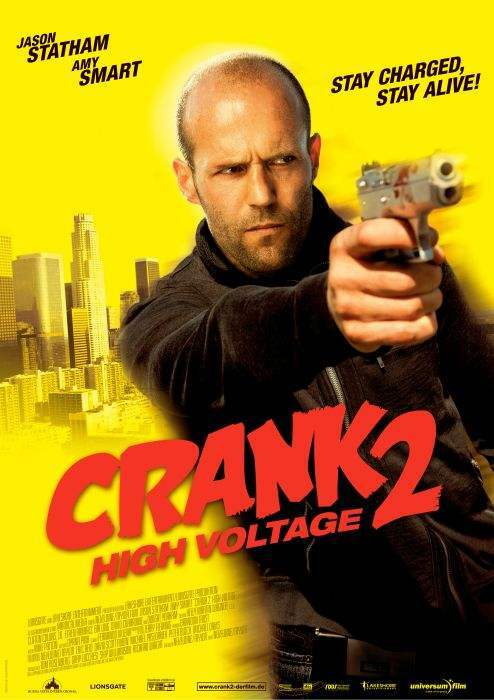 Which is not to say that I didn’t enjoy CRANK 2. It’s probably not going to be for everybody, but I found it entertaining. Just be aware that it makes a movie like, say, SHOOT ‘EM UP, seem genteel and restrained. I've never been much of a John Denver fan or an Olivia Newton-John fan, but for some reason I've always liked this duet they did. Maybe it's the sort of melancholy feeling it has. That's a pretty good-looking blonde if you go for dames a little on the slinky side. (I'm sorry. I can't help it.) This issue of NEW DETECTIVE also features plenty of good authors, including Day Keene, Frederick C. Davis, Talmage Powell, and G.T. Fleming-Roberts. There's also a David Crewe story, but I don't know if it's one of the yarns David Goodis wrote under that house-name. Probably not.This looks like a good issue to me, anyway. 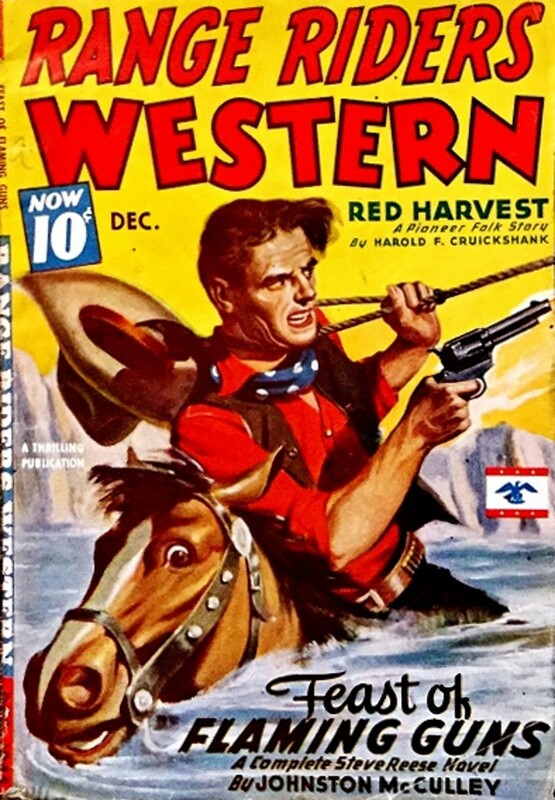 An unusual perspective on the cover of this issue of BLUE RIBBON WESTERN, something you ran into from time to time, especially in the late Forties, which seemed to be an era of greater experimentation in Western pulp covers. It's hard to say much about the authors in this issue. Cliff Campbell was a house-name, so there's no telling who wrote the lead novel, and the others are all unknown to me with the exception of Thomas Thursday, who was a prolific pulpster for more than forty years. I’ve mentioned that some years ago I went on a Luke Short binge and read a bunch of his books. 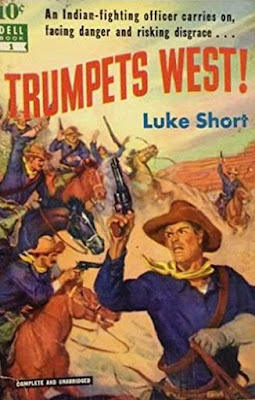 One I never got around to until now is TRUMPETS WEST!, a short novel that was published as part of the Dell 10 Cent series. This is a cavalry yarn about hard-bitten frontier soldier Lt. Burke Hanna, who’s assigned to a fort in Arizona Territory near an Apache reservation. There’s an uneasy peace between the Apaches and the cavalry at the moment, but there’s also a constant threat of the Apaches leaving the reservation and going on a rampage. As if that’s not enough, Burke also has to deal with a commanding officer who doesn’t like him and who may or may not be corrupt, an Indian agent who’s definitely crooked, and a brutal sergeant with a grudge against him. Plus he’s about to get married to the beautiful sister of the post’s adjutant. That romance is pretty much an afterthought because there’s so much else going on in this book. Short, whose real name was Frederick D. Glidden, could really pack in the plot when he wanted to. TRUMPETS WEST! is an almost perfect blend of hardboiled action and plot development, and while there aren’t any big twists, Glidden is such a good storyteller the predictability doesn’t really matter. In addition, he paints what seems to be to be a pretty accurate picture of army life in Arizona Territory during that era. He gets the physical details of the fort right, instead of having it surrounded by a tall wooden stockade fence like we see so often in the movies. (I don’t mind that particular inaccuracy, but it’s nice when somebody gets it right, too.) Burke Hanna doesn’t regard the Apaches as mindless savages, either. In fact, he has quite a bit of sympathy for them, although it never comes close to “Lo, the poor Indian!” mawkishness. TRUMPETS WEST! is a good example of why I’m a Luke Short fan. His books are just good solid traditional Westerns. 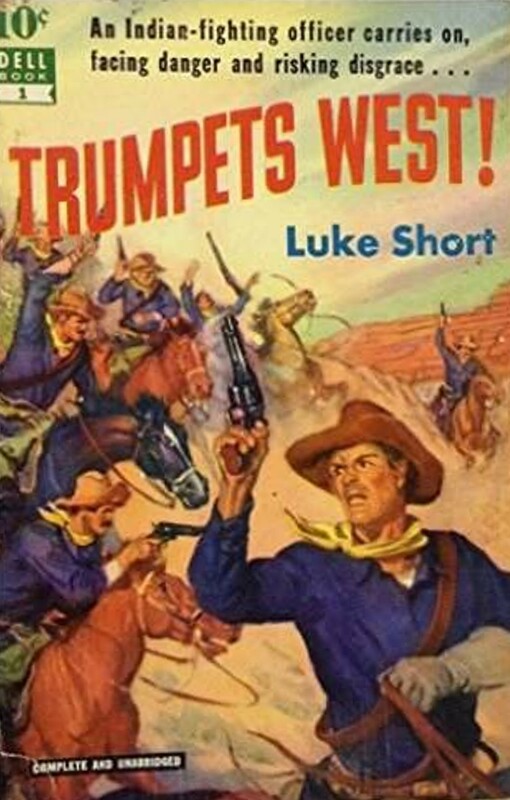 I believe this one was reprinted in the collection LUKE SHORT’S BEST OF THE WEST, but I don’t have a copy of that volume to check. There’s an e-book version available, though, if you don’t have the Dell 10-Center on your shelves. I enjoyed it quite a bit, and I suspect I’ll be reading something else by Luke Short before too much longer. CRANK is one weird movie. Evidently inspired by the classic film noir D.O.A. (although there's no mention of that in the credits, at least that I noticed), this is an updated version of that story. A hitman (Jason Statham) gets crosswise with some of his gangster associates, and one of them injects him with a bizarre poison that will kill him unless he keeps moving fast enough to force his body to produce enough adrenaline to counteract the effects of the poison. With the time he has left, he sets off to avenge his own murder. It's an interesting premise, and as you'd expect, the movie is full of action. The direction and photography are hyper-stylized, with all sorts of fast motion, stop motion, other special effects, and strange lighting. This takes some getting used to but is generally effective. The movie also features the oddest cell phone ringtone I've ever heard. All of the tricks combine to make this one of the more disconcerting films I've seen. I liked Jason Statham in the two Transporter movies, and he's good here, too, although the character he plays is considerably less sympathetic. Nearly every character in this movie with the exception of the protagonist's girlfriend is a criminal. You can't help but get involved with the quest to see justice -- or at least revenge -- done before time runs out, though. Worth watching, but don't expect a normal movie. That's a really wild-looking cover. 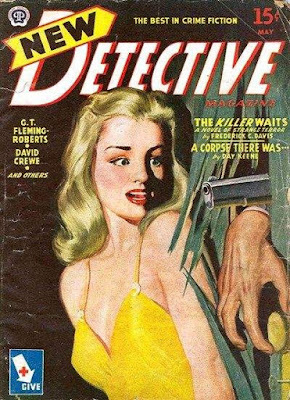 Since I don't have a copy of this pulp, I don't know if it's meant to be metaphorical or not, but it's eye-catching, that's for sure. Inside are stories by veteran pulpsters Arthur J. Burks, Seabury Quinn, Otis Adelbert Kline, George Allan England, and others. 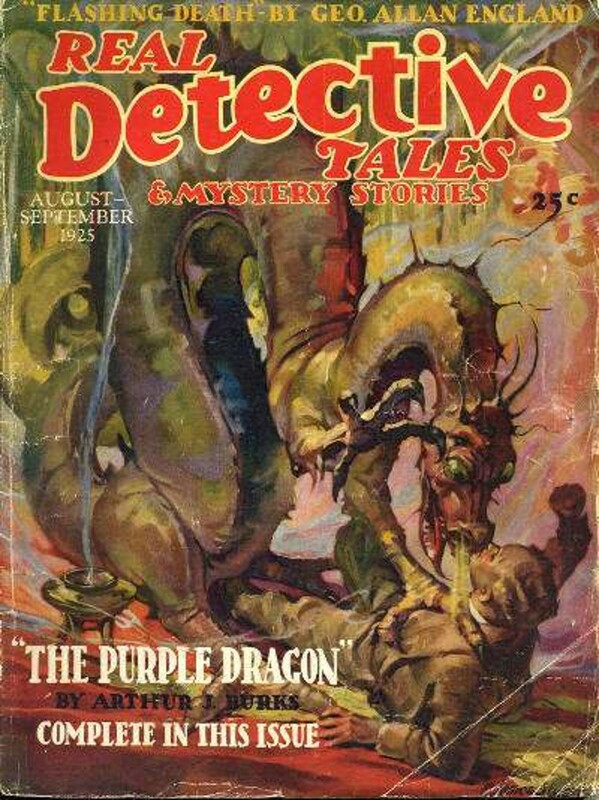 I don't know anything about REAL DETECTIVE TALES AND MYSTERY STORIES, but the covers are an odd mix of Western, detective, and fantasy. This week's scan comes to us again from David Lee Smith. It's from a Western pulp I like quite a bit, RANGE RIDERS. 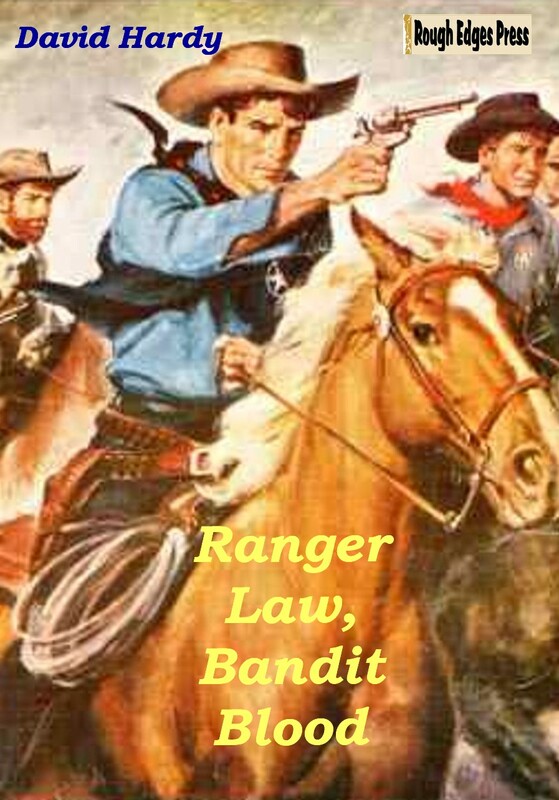 For those of you unfamiliar with the series, RANGE RIDERS was a character pulp, one of many from the Thrilling Group. By that I mean it had a lead novel in every issue featuring the same character, or in this case, group of characters. 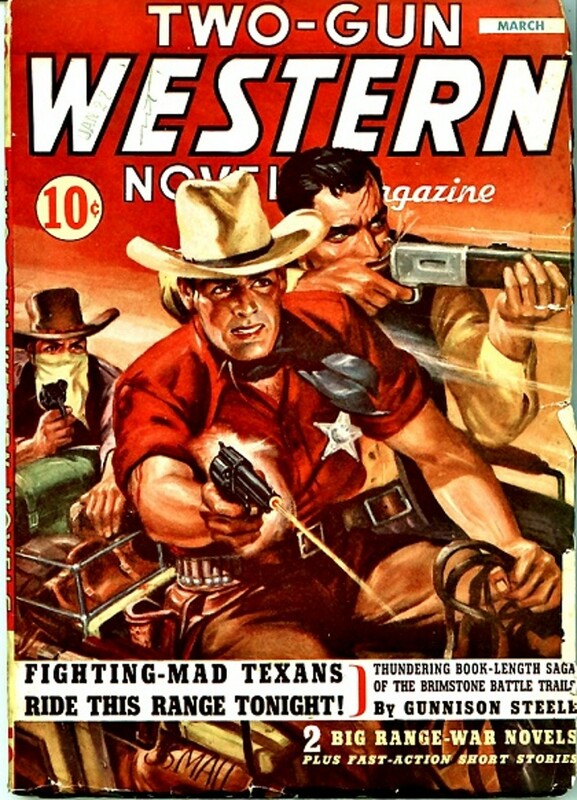 The other such pulps from Better/Standard Publications were TEXAS RANGERS (featuring Jim Hatfield), RIO KID WESTERN, and MASKED RIDER WESTERN. 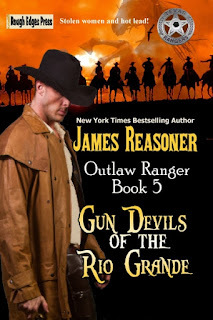 The stars of RANGE RIDERS were Steve Reese, Hank Ball, and Dusty Trail, a trio of range detectives who worked for the Cattlemen's Protective Association. The stories were billed as Steve Reese novels, but Hank and Dusty always played major roles, too. The series was created by Oscar J. Friend, or at least I assume it was since he wrote the first several novels. Many of the usual Thrilling Group suspects contributed to the series, including Tom Curry, Walker A. Tompkins, Gunnison Steele, T.W. Ford, Samuel Mines, and in this particular issue, Johnston McCulley. I haven't read this one, but I've enjoyed all the others I've read. Also in this issue is a story by Harold Cruikshank in his Pioneer Folk series (also know as the Sun Bear Valley series). These are pretty mild tales about a group of homesteaders. I haven't read one in years, but this series was never a favorite of mine. They might be better than I remember, though. I guess Cruikshank wasn't familiar with a novel entitled RED HARVEST by a guy named Hammett . . . or didn't care. Fletcher Flora is one of those writers whose books I’ve seen around for decades without ever reading any of them. I have read some of his short stories in various crime and mystery digests and recall enjoying them. 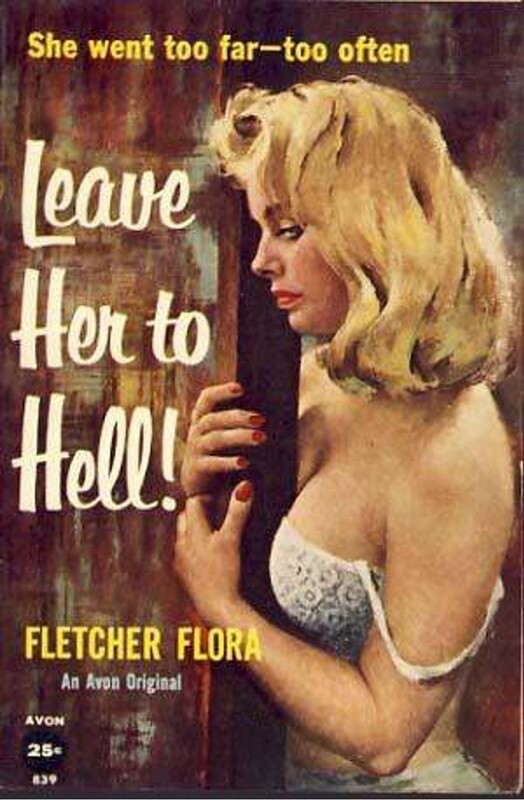 Stark House has just reprinted three of Flora’s novels in one volume, so LEAVE HER TO HELL isn’t, strictly speaking, forgotten, but I’m sure it hasn’t been widely read in recent years, either. Originally published by Avon in 1958, this is pure, 1950s-era private eye fiction. The narrator, Percy Hand, works as a private detective in a fairly large but unidentified city. He’s hired by the mistress of a rich financier to find out what happened to the guy’s previous wife, who disappeared a couple of years earlier. Everybody seems to think she ran off with her lover, who happened to be the brother of a local “restaurant owner” (actually a mobster, of course). A few other questions pop up in Hand’s investigation: an unsolved hit-and-run death; 75 grand that may or may not be missing; one of Hand’s sleazier competitors in the PI game who keeps tailing him; and assorted beautiful women who wind up kissing him. Needless to say, there’s a lot of snappy banter, Hand gets hit on the head and knocked out, and multiple corpses turn up. I had a wonderful time reading this book. Flora’s dialogue is great, the plot is suitably complex without being hard to follow (with a very nice twist at the end, by the way), the tone is light and breezy for the most part but has some darker undertones here and there, and most importantly to me, while I was reading it I felt like I was back in high school again, devouring all the private eye novels I could get my hands on. That’s enough reason right there for me to give it a high recommendation. Fletcher Flora didn’t write just private eye novels but other types of mysteries as well, and I have several of them on hand to read, now that I know what a fine writer he was. I’m pretty happy about this. Well, I’m slowly working my way through Preston Sturges’s movies. 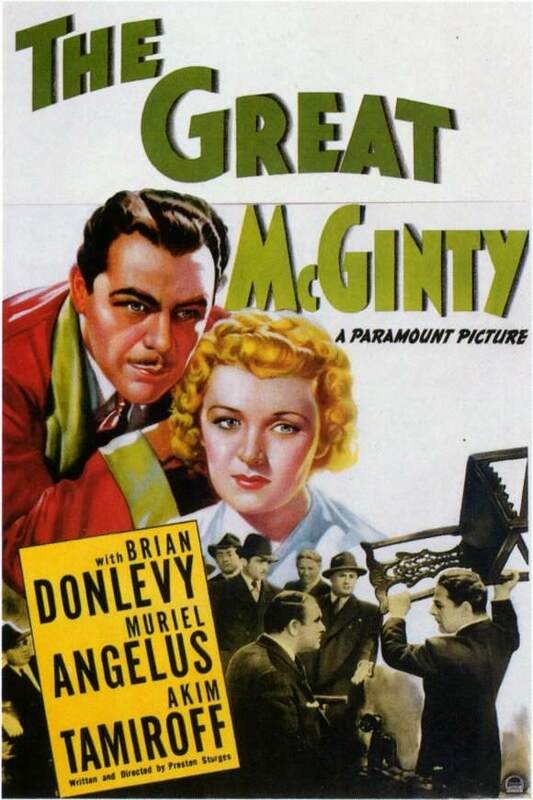 THE GREAT McGINTY, from 1940, is the first film he both wrote and directed. The story is told in flashback by a bartender in a nightclub in some unnamed “banana republic” and concerns the rise and fall of a political fixer named Dan McGinty who goes from a hand-to-mouth existence as a hobo to being elected governor of the also unnamed state where the story takes place. Despite all that, THE GREAT McGINTY is worth watching because of the performances and Sturges’s dialogue. The plot may not hold together very well, but good actors and good dialogue can salvage a lot. I’ve never been a big fan of Brian Donlevy, although he’s great as the brutal Sergeant Markoff in BEAU GESTE, but he’s really good as Dan McGinty, too, especially in the scenes where he’s not sporting his usual pencil-thin mustache. Akim Tamiroff is the head of the corrupt political machine behind McGinty, and the great William Demarest is one of his henchmen. I’d never heard of Muriel Angelus, who plays the secretary who winds up marrying McGinty (in fact, this was her last film before she retired after a short career in movies), but she’s not the typical leading lady of the era and is quite effective in the role. I had a few problems with the plot of HAIL THE CONQUERING HERO, the other Sturges movie I’ve watched recently, but I liked it overall and I liked THE GREAT McGINTY, too, well enough that I’m sure in due time I’ll get around to the other Preston Sturges movies I haven’t seen. 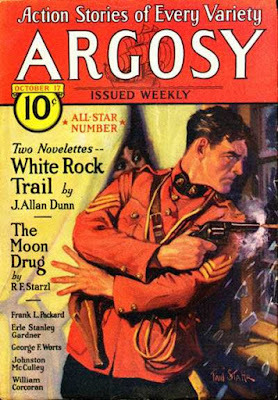 A pretty good Mountie cover by Paul Stahr on this issue of ARGOSY, and dang, look at those authors! All-Star Number is right. Erle Stanley Gardner (a "Whispering Sands" story), Johnston McCulley (an installment of "Zorro Rides Again"), George F. Worts, J. Allan Dunn, and Frank L. Packard, among others. That's a bunch of good reading there, I'll bet. This week's scan comes to us courtesy of David Lee Smith, and it's a good one. I've read a bunch of stories by Gunnison Steele, who was really Bennie Gardner, and enjoyed all of them. He has the lead novel in this issue of TWO GUN WESTERN NOVELS MAGAZINE and is probably the biggest name among the authors as well. The others include Kenneth P. Wood, Bill Davis, James Shaffer, and Miles Overholt. I think I’ve mentioned before that I read a lot of British mysteries when I was in junior high and high school. 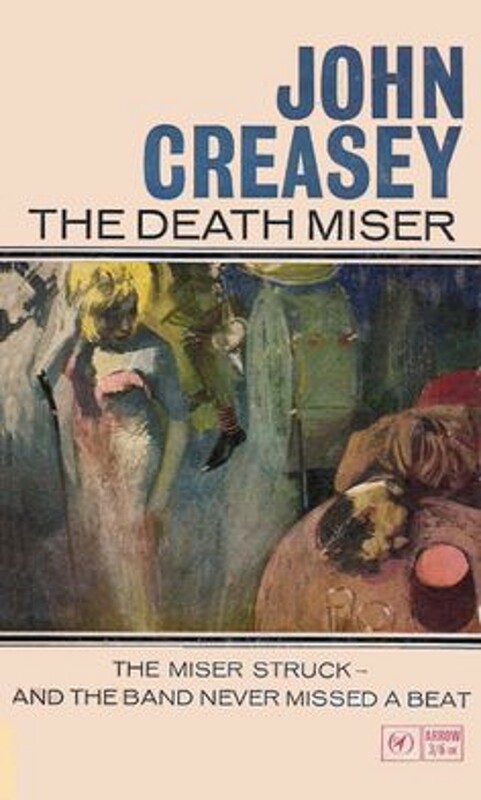 One of the authors I read regularly was John Creasey. His books were readily available in all the libraries where I checked out books, and they were usually pretty entertaining. I was introduced to Creasey’s work by the TV series THE BARON, which wasn’t a very faithful adaptation of the character but was enjoyable enough to make me seek out the source material. Most of the Creasey novels I read featured either The Baron, Inspector Roger West, or Commander George Gideon, although I think I read one or two of the Toff series, as well. One series I never read—until now—was Department Z, about a top secret branch of British Intelligence that used mainly civilian operatives, all under the command of spymaster Gordon Craigie. The first book in the series, THE DEATH MISER, is available as an e-book, so I decided to give it a try. That starts the plot galloping along, and before you know it, there’s a murder in a London nightclub, disguises, secret passages, bizarre weapons, and a plot to take over the world. Quinion gets hit on the head and knocked out a few times, falls for a beautiful girl who may or may not be trustworthy, takes part in numerous chase scenes, and finally saves the day and reveals the mastermind behind everything. This novel was published originally in 1933, and Creasey revised and updated it for a reprint in 1965, which is the version I read. I wish he hadn’t – let books stay in the era for which they were originally intended, I say – but in this case the updating seems really minor, a mention of Hitler and a few other things but nothing that actually affects the story. And the atmosphere is definitely still the Thirties. Creasey seems to have been influenced by Leslie Charteris. Quinion recruits a couple of his friends to help him in his battle against the bad guys, and they reminded me a lot of Roger Conway, Norman Kent, and Monty Tremayne, Simon Templar’s sidekicks. The villains in THE DEATH MISER are also very reminiscent of the villains in THE LAST HERO and THE AVENGING SAINT. At the same time, a lot of the trappings of this book, as well as a secret meeting of the bad guys that Quinion manages to get into, reminded me a great deal of GOLDFINGER, so I have to wonder if Ian Fleming ever read Creasey. I have no idea, but it seems possible. Even the updated version of THE DEATH MISER is really dated, but it’s also a lot of fun. Creasey knew how to keep a yarn racing along. I know I have several paperbacks by him on my shelves. I may pull one of them out and give it a try before too much longer.